Ram Dass, the American academic-turned-Hindu-guru, now in his eighties (whom I’ve been following on Facebook of late), has been teaching students and readers how to Be Here Now, ever since his seminal (and still in print) book was published in 1971. I confess to not being one of the book’s millions of readers, but the title at least has never meant as much to me as it does right now at this stage of my life. 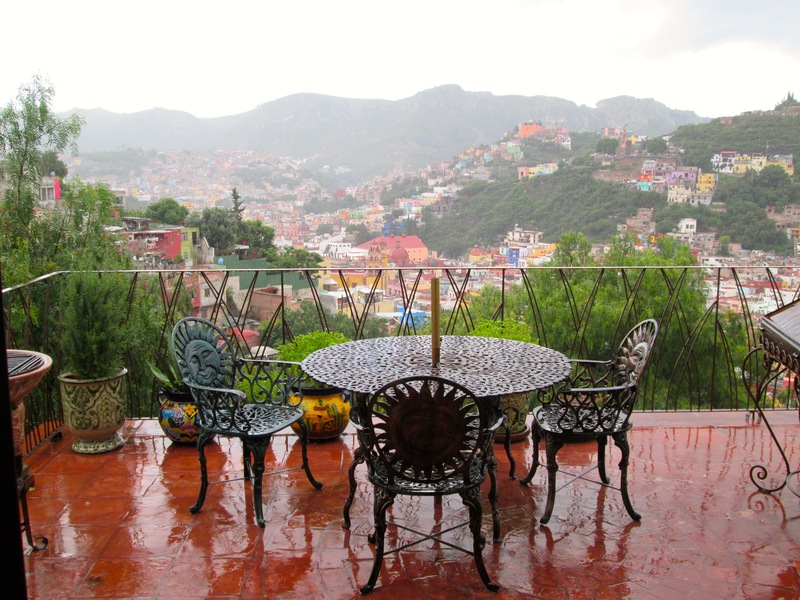 Here and now, in Guanajuato, Mexico, for four months, far afield from my comfort zone (my “woman-cave” condo in Taos, New Mexico), on my own, not-yet-Spanish-speaking, and newly embarked on my seventh decade of life, I’m learning, as if for the first time, how to Be Here Now. I’m sure Ram Dass would agree with me that it’s about time. Every day in this present “now” is new and colorful and thrilling in its own way. New sights, sounds, smells, tastes. New challenges, new lessons, new stairs to climb. I’m gradually becoming attuned to the new music and learning new dance steps. My head is spinning from all of the surprises. I could never have planned all this. In an earlier stage of my life, as a professional caterer in Manhattan for ten years, planning for future events was something I think I excelled at. I could look into the future (into “my crystal ball,” I boasted), visualize the successful celebration, then break down all the steps required to get to that eventful day. I didn’t live in the “now” – if I ever knew how; I lived in the “when” of the scheduled occasion. But that was then. And “then,” as it should be, is past. Now, I’m realizing at this stage, “when” – what might happen in the future — becomes a bigger and bigger unknown. But the impulse to plan ahead still lingers, like a computer program I can’t erase from my brain. At 70, making smart plans for your post-retirement years seems like the grownup thing to do, if you haven’t done enough of it already. The biggest questions for me, though, in this particular process, are: How long will I live? And: How can I make plans when I don’t know when the ultimate event will take place? I find myself wishing I could know my death date, the way I know my birth date. Knowing that would make planning so much easier. Let’s say that were possible, and the date I’m given is two years from now. Ah, I’d think to myself, it’s back to my woman-cave in Taos for me – surrounded by dear friends and comforting familiarity. But if the date were farther into the future, say five or ten years away, I’d choose to move to Mexico, where life is happy, slower, and less stressful, the cost of living lower, and my retirement savings, such as they are (after having supported myself as a single woman all of my adult life), might stretch that far. The hard truth is that the United States is a great country and a fine place to live — if you have sufficient money. But if you don’t, it’s not. So it comes back to this: I must teach myself to Be Here Now. I must repeat to myself, “You only have today! Que sera sera….” And so on, and so on. The caterer in me wants to plan but finds she can’t. The newfound adventurer turns on her heels, throws up her hands as if dancing some kind of solo tango, and laughs.